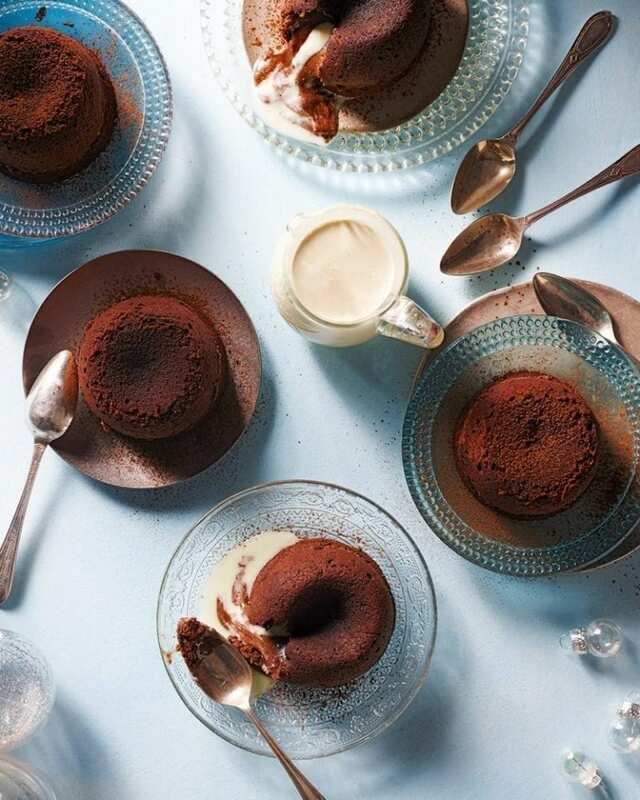 Break open these hot chocolate fondants to reveal a luscious puddle of melted white Lindor truffle. Heaven. Brush inside all the moulds with melted butter, then chill for 5 minutes. Repeat the brushing, making sure the moulds are well coated to stop the fondants sticking when cooked. Tip the cocoa powder into one of the dariole moulds and roll it around until the inside is coated with cocoa, then tip the leftover cocoa powder into the next mould and repeat until all the moulds are coated. Put the moulds back in the fridge while you make the fondants. Put the chopped dark and milk chocolate in a heatproof bowl set over a pan of barely simmering water (don’t let the bowl touch the water) and leave the chocolate to melt gently. When completely melted, stir to combine, then set aside to cool until just warm but still liquid. Stir in the 200g melted butter until combined. Using an electric hand mixer in a mixing bowl (or a stand mixer), whisk the eggs and sugar until the mixture is pale, thick and just holds a ribbon shape when you lift the beaters (about 4-5 minutes). Sift in the flour and gently fold in until combined. Pour in half the chocolate/butter mixture and mix until just combined, then repeat with the remaining mixture. 5 Pour half the batter evenly into the prepared moulds, then put a Lindor truffle in the centre of each. Top with the remaining batter, then put on a baking tray and chill for 30 minutes. Heat the oven to 200°C/180°C fan/gas 6. Bake for 11 minutes from chilled. The fondants are ready when you can see a visible crust on top of each pud and they’re starting to pull away from the sides of the moulds slightly. Take out and, working quickly, cut one of the fondants to check. If it’s done to your liking, take the rest out of the oven. Let the fondants sit for 30 seconds, then invert onto plates, dust with cocoa powder and serve with crème fraîche or cream. The recipe makes 9 puds to serve 8 – sacrifice the extra one to check the centre. (We won’t judge you if you eat it…) Freeze the leftover egg whites in a labelled food bag for up to 6 months. Make to the end of step 5, loosely cover with cling film and chill for up to 4 days, then cook as in step 6. Or wrap well in cling film and freeze for up to 3 months. Unwrap and bake from frozen for 16 minutes.